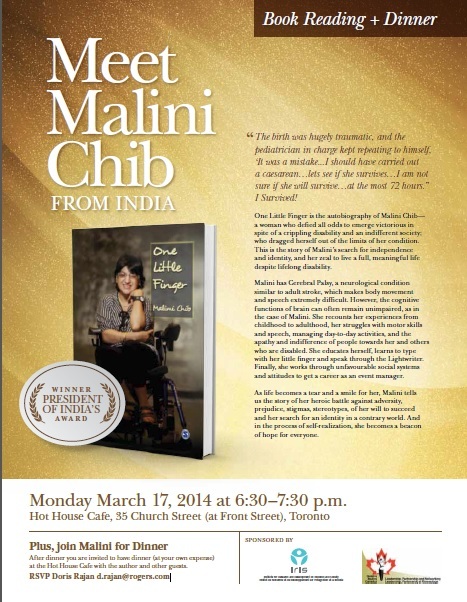 Monday March 17, 2014 at 6:30–7:30 p.m.
One Little Finger is the autobiography of Malini Chib — a woman who defied all odds to emerge victorious in spite of a crippling disability and an indifferent society; who dragged herself out of the limits of her condition. This is the story of Malini’s search for independence and identity, and her zeal to live a full, meaningful life despite lifelong disability. Malini has Cerebral Palsy, a neurological condition similar to adult stroke, which makes body movement and speech extremely difficult. However, the cognitive functions of brain can often remain unimpaired, as in the case of Malini. She recounts her experiences from childhood to adulthood, her struggles with motor skills and speech, managing day-to-day activities, and the apathy and indifference of people towards her and others who are disabled. She educates herself, learns to type with her little finger and speak through the Lightwriter. Finally, she works through unfavourable social systems and attitudes to get a career as an event manager. As life becomes a tear and a smile for her, Malini tells us the story of her heroic battle against adversity, prejudice, stigmas, stereotypes, of her will to succeed and her search for an identity in a contrary world. And in the process of self-realization, she becomes a beacon of hope for everyone. After dinner you are invited to have dinner (at your own expense) at the Hot House Cafe with the author and other guests.